Pew Study Predicts Islam's Growth Spurt Will Make It The World's Dominant Religion by Century's End : Goats and Soda A new report from the Pew Research Center shows a growth spurt for Islam — and a change in the hub of Christianity. 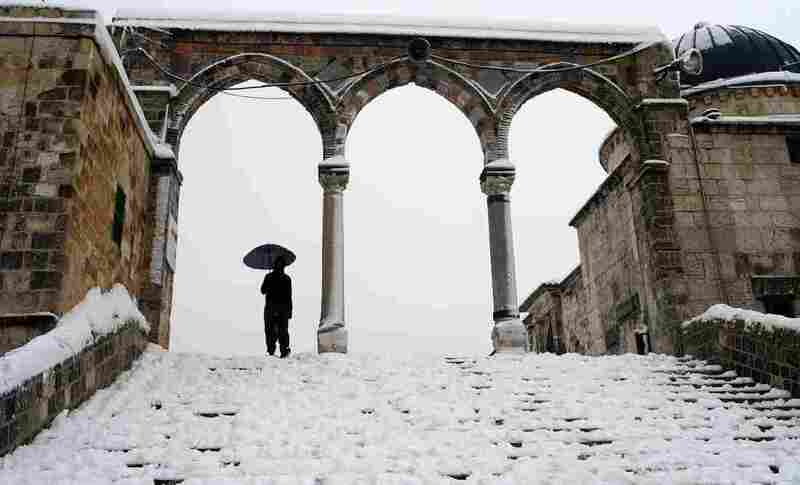 Al Aqsa Mosque in Jerusalem was dusted with snow in February. By the end of the century, Muslims could outnumber Christians for the first time in history, according to a report released by the Pew Research Center. "Another way of thinking about it is Christianity had a seven-century head-start on Islam, and Islam is finally catching up," says Alan Cooperman, the director of religion research at Pew. Christianity is currently the world's largest religion, making up a third of the world's population with 2.2 billion adherents. Pew research shows that Islam is the fastest growing religion in the world. The religious group will make up 30 percent of the world's population by 2050, compared to just 23 percent of the population in 2010. That means the number of Muslims in the world will nearly equal the number of Christians by 2050. If Islam's growth spurt continues, Pew data shows, Muslims could outnumber Christians soon after the year 2070. That's not to say that the total number of Christians is decreasing; Christianity's growth rate is just not as fast as Islam's. While the number of Christians will increase from about 2.1 billion to 2.9 billion by 2050, Muslims will jump from 1.6 billion to 2.8 billion. This growth has to do with the relatively young age of the Muslim population as well as high fertility rates. Other religious groups have aging populations. Among Buddhists, for example, half of adherents are older than 30 and​ the average birth rate is 1.6 children. By contrast, in 2010, a third of the Muslim population was under 15. What's more, each Muslim woman has an average of 3.1 children, while the average for Christian women is 2.7. The Pew research revealed two other interesting shifts in world religious perspectives, Cooperman says. Atheists, agnostics and those who do not affiliate with religion will make up a smaller percentage of the world's total population by 2050 — even though the group is growing in the U.S. and Europe. The decline is primarily because those who are unaffiliated religiously have low fertility rates, with women bearing an average of 1.7 children in their lifetime. Cooperman emphasizes that a lot could change between now and 2050.